A couple weeks ago, my friend Nathan shared a C.S. Lewis quote in his sermon. I’ve heard so many things since then – whines, complaints, praises, prayers, songs, stories, commercials, and silence. When we had some guys renovating the kitchen at our old house, we were on vacation. (That's a glimpse of our old house with its renovated kitchen above.) When the guys from Lowe’s install central heating and air along with new windows in that same old house, we were at work. We left town the weekend our bedroom in that old house was being dry-walled. We had walls painted and new flooring installed in the new-to-us house in which we currently live before we moved in. I don’t like living among messy projects. But, really, I do every day. Nothing in my physical house is being renovated or restored or painted or perfected, but the essence of life is we are on a journey of growing and learning and teaching and serving. We aren’t perfected yet. God isn’t done completing the work he’s begun (Philippians 1:6). I can be in the midst of parenting, and God is teaching me about patience and grace. Cleaning my house is a reminder to serve others. Being with friends gives opportunities to speak truth and serve one another. Marriage is a sermon straight from the Maker on humility, grace, and unity. And sometimes these lessons are messy. God doesn’t require we clean up the dry wall dust or vacuum the crumbs. Formal attire certainly isn’t required. He’s coming into the middle of what we’re doing. He’s making us new moment by moment. He’s renovating our souls for his glory. And, unlike my tendencies with big house projects, God wants us present as he’s working so we don’t miss the creation – which is bound to look nothing like we expect. Kristin, I love the CS Lewis quote! Having lived through a few renovations myself, while the process may not be all fun, the end result is wonderful! So grateful He continues to work with us until the project is completed. Wonderful insights this morning! I love this. I am in the middle of a few home projects right now and I just want to get my house together. But, I grew up with a renovating Mom, so we always had a project going on. I love the C.S. Lewis quote. 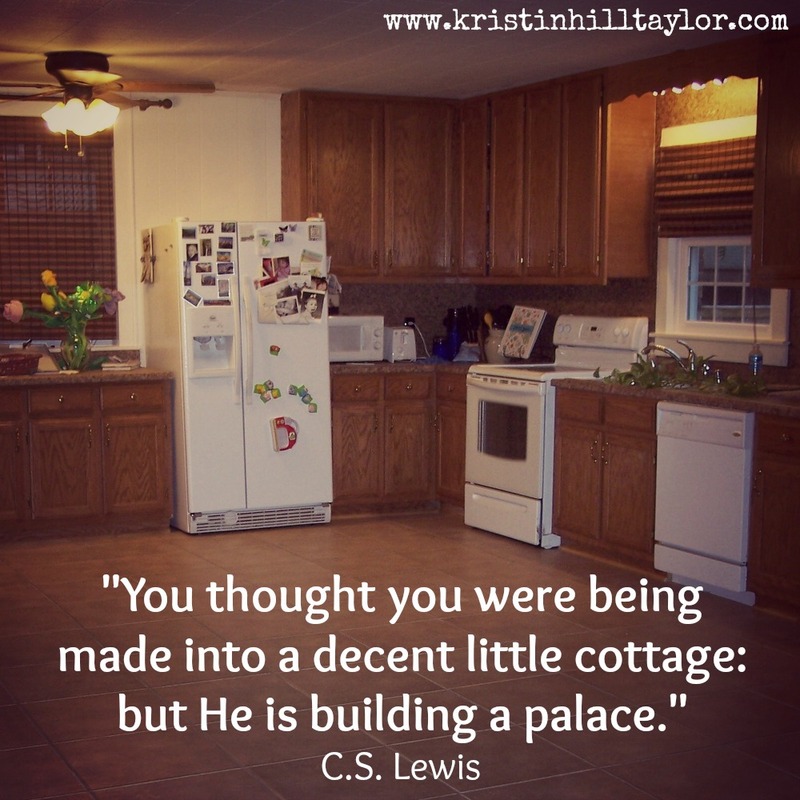 I feel as if God is knocking down walls is happening in my life all the time, but as he says, God is not aiming for a cottage, but a palace. Any of us who have been through a renovation in the natural know it is so worth it. So, how much more should we hold on for the end result in us? Yeah, I agree that his creations and renovations usually are nothing like we anticipate or plan. Only God could trump our dream home redo with something greater. I love CS Lewis. Such a wise man and so gifted with helping me understand truths about God. That kitchen up there looks enormous! Wouldn't it be great if God did all the renovating as we sleep? Yup. As always, so very grateful that God is not afraid of messy. Good words, friend. First, I love the pic of your kitchen!! I don't like ours at all. I have the dream of one day winning the lottery so we can remodel...maybe! My hubby just happened to see the same picture (I was dropping him a hint) and he said, "Wow, that is so inviting...looks like home." So, there ya go friend!! It hurts sometimes, but it is always worth it. Glad you're here, Janet! I hadn't heard that C.S. Lewis quote before (obviously I need to read him more! ), so I was glad I got enough of it down during church a few weeks ago to then find it online. Gotta love technology! :) "The mess if proof He hasn't given up on me." ---> YES! Thanks for that. Yes, me too, Beth. Thanks for being here. I need to read more C.S. Lewis because whenever I do it's so very good and true. Let me know if you figure out how to undergo renovations while you sleep - I'd be all about that! :) I'm glad you're here, Michelle! Housing hunting can be so fun and yet so frustrating, so I hope you're getting opportunities to really enjoy it. Glad you're here, Katie! Such a good thing to think about, Kathleen! The end result is going to be amazing, beyond anything we can comprehend, but I too often lose focus of that! Thanks for being here! Isn't that neat to think about? Our dream home can be (and will be) better than we ever imagine ... goodness. It'll be glorious! Thanks for being here, Melody! I adore your faithfulness on Wednesdays. I love seeing your face here and reading your comments. You're such an encouragement on this big ole internet. The awesomeness of your words and the C.S. Lewis quote - oh, yes! We are a messy construction project, aren't we?! So grateful that God isn't done with us and that He is constantly molding and making us more like Him. Thank you for sharing your heart! Thanks for being here with sweet words, Tiffany! Love the CS Lewis quote. I believe he didn't write one bad thing. I love the example of how just as a house can be under construction we as people are always under construction. Our vision of the final product might not live up to what reality is but with God directing the construction you know it will be good. Beautiful words today. Thank you, Mary. I'm so glad you're here! Thanks, Dawn. So glad you're here with encouragement. Great lesson Kristin and I just love that quote. It's so easy to look at the messy project but God sees the completed picture. Thanks, Mindy! I'm always glad you're here.